Rusty: Hello, and welcome to our first lesson in this series. Rusty: I wont be able to say enough about Mark. The impression he has made on the music industry goes way beyond his guitar playing and just one style of music. As we go along and move through the years I'll highlight some interesting facts that may contribute to our lesson, the guitar player, and music in general. Hopefully this lesson and example will sound like some of his earlier recordings. Some of his main guitars back then were a red 60's era Fender Stratocaster, a Shecter Tele, and Shecter Strat. On his earlier recordings he played through different Fender amps like a Vibrolux, Twin, and Super Reverb. Many things make up Mark's style. The most important is that he plays with his fingers and doesn't use a pick. Above all, this will be the biggest thing you will want to work on. Rusty: The chord progression is - Dm Bb / C Csus4 - repeating until the end of the song. Rusty: On the tab you will see this symbol (*). It is used to designate when I play with my thumb. For the rest of the chord I use my index finger and middle finger. Rusty: Hold the chords while you play the notes out of that chord. Let me send you a midi tab that better explains this. It may help some of you. Rusty: Notice I keep my thumb mainly on the 5th and 4th string playing the bass notes and let my fingers strike the rest of the chord. The progression is similar to some of the Dire Strait songs "Sultans Of Swing" and "Lady Writer". The beat is a regular rock beat with a pattern similar to something like "Expresso Love". This type of progression is used in several of his rock songs. One of the latest ones was "What It Is - Sailing To Philadelphia". The cool thing is, you can learn the licks from these different songs and easily interchange them with one another. I'll show you more about this when we cover some licks. We are in the key of F major/D minor. Rusty: Most of the licks come out of these two D minor pentatonic scales. They will make a great exercise for warming up your fingers.Practice these scales alternating between your thumb and index finger. The same way you would with a pick. 1) I used my thumb and index finger to play all of the licks. That doesn't mean you have to play them this way, but it's less confusing wondering which fingers to use. 2) On the tab you will see this symbol (*). It is used to designate when I play with my thumb. The blank will mean my index finger. The videos will also help with the fingerings. Rusty: This first lick is something like an intro. We add an extra note to the D minor pentatonic scale that helps emphasize the D minor chord. Let your fingers have a soft touch on the strings. Rusty: Lick 2 is a rake down the D minor triad which again emphasizes that minor quality. You can achieve the rake by letting your thumb brush across the strings while holding the D minor triad. 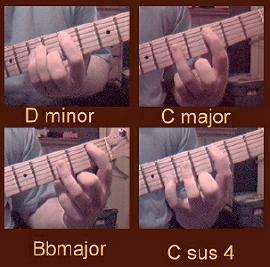 Here you can start to dig in to the strings a little by "popping" the notes with your index finger. Rusty: With those two licks you should be able to hear the difference your thumb makes versus your fingers. I would use your thumb for soft subtle touches and your index finger to pop the strings. Lick 3 is a long bend that adds a nice effect. You will hear Mark play licks like this along with volume swells to add to a verse etc. By brushing your thumb down the muted strings you can pick up some extra sounds that make the lick dirtier. And when you bend that note it will sometimes sound similar to a volume swell. The dirtier the tone is the more harmonics and feedback. For an idea of that listen to some of his latest songs like Calling Elvis and Heavy Fuel. He does use a volume pedal. That will make these types of licks more interesting. Rusty: Mark has played and several different guitars. He use to use Strats and Teles. Then he switched to a custom shop guitar called a Pensa Surh. It's basically a supped up strat style guitar with EMG pickup's. You can also find him playing a Les Paul and several kinds of acoustics. As I stated earlier, he use to use Fender amps pretty regularly. Then he switched to Mesa Boogie and more recently to Soldano. Rusty: Lick 4 is a common rock lick, but when you add in the pickup notes and play with your fingers it becomes a little difficult but symbolic of his style. On lick 4 the X'd out numbers mean to mute those notes at the 12th fret. Just lift your finger up above the string. So that note mutes out. Rusty: On the last part of the lick keep your first finger anchored across the 1st and 2nd string at the 8th fret. Rusty: Lick 6 should be the hardest of all. Refer to the tab to see which finger I used to pick the string. Once you get the rhythm in your fingers at a slow tempo start speeding it up and it will naturally start sounding like Mark. Rusty: You will want to play Lick 6b twice. This is probably his signature lick that everyone is familiar with from the Sultans Of Swing solo. It is also a lick that you can use over and over. The lick is made of three notes called triads. The same notes in the triads are also the same notes that make up the chord which they are being played against. If you look at the tab, I put the names of the chord just before each triad. You can use the first triad over any minor chord as long as you know where the root note is. The root note is the second note played at the 10th fret. That note is a D which follows along with our D minor chord. The second and third triad are major and they will work over any major chord. The root note for them falls on the last note played in the triad. For C it would be the 11th fret of the 2nd string. Say you wanted to use the same lick over a chord progression that had an F#m / D / E. You would use the same patterns for major and minor triads but move them according to where the root notes are. Rusty: Here is an example. Rusty: Lick 7 is more of an R&B lick that helps unwind the solo like and outro or ending. Those first 3 licks are not that difficult. Mark often refers to his guitar as another "voice" rather than an instrument that has to play certain notes at a certain time. Take some time making up licks such as these. Let the touch of your fingers be just as important as the notes your playing. In short be "Soulful"! My main concern is that you realize how many different sounds you can create with just your fingers. The tone I used to record was fairly simple, clean. You can experiment with volume swells, wah pedal, and different distortions to add character to the licks. Mark does and we'll talk about it more later.